Prepared By : Madam Jehet N.
Periuk Kera, or Pitcher plant (Nepenthes species). In Bidayuh, it is called 'trambuak'. 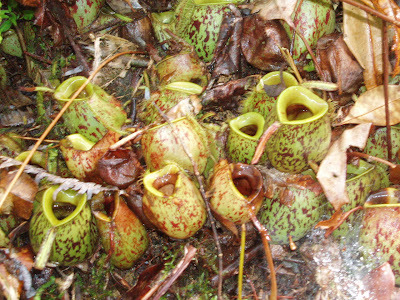 The one shown here is Nepenthes ampullaria and you can find more information regarding Pitcher Plant, and other types of pitcher plants which can be found scattered among Borneo-Sarawak region here . On the day of my trip back to Kuala Lumpur, my mother made this special treat for me among the Chang that she prepared. It was a 'limited edition' and one of my childhood treat, so I treasured it a lot and did not have the heart to eat it till the last minute. Glutinous rice is used to make the ketupat. It is soaked in water overnight. After the water is drained, salt is added to taste. Filling is normally not necessary as other accompanying dishes can be cooked separately. The pitcher plant is cleaned and then filled up with rice 3/4 full. Clipped at the mouth with a wooden toothpick. Cooked in a pot of water for about an hour or until the rice is soft and cooked. To eat it, just peel off the pitcher plant skin. It's a very unique experience I can tell ya! I'm really impressed by all your unique recipe.To me, ketupat in a pitcher plant is something out of the ordinary.Just wonder how it tastes. Haha!! Indeed they are unique, it's a reflection of our distinct Borneo-Sarawak exotic food, especially the Iban/Bidayuh or Dayak cuisine. It has been a long time since I last eat it actually, until my mom made it last month. I didn't know that they are sold in Serikin, thanks for the info mama! The ketupat in periuk kera, have not try it yet but seem like very nice. Really, you should try it at least once. It's unique, and smell nice too. As another reader commented, you can easily find this at Pasar Minggu at Serikin border in Bau. u mean the recipe here as a general, or the ketupat periuk kera? that's interesting to hear.